We’d love your help. Let us know what’s wrong with this preview of Women of the Word by Jen Wilkin. To ask other readers questions about Women of the Word, please sign up. The principle that this book argues for is by all means important and I cannot agree more with the author: Become a woman of the Word. Jen Wilkin does a wonderful job in explaining why is it important -extremely important- to study the Word of God faithfully. I would give this book 5 stars from pages 1-108. On the next pages (p.109-145), the author proposes a method to study the Scriptures (and because of these pages I dropped the rating down to 4 stars). Her method is good and in-depth, but I a The principle that this book argues for is by all means important and I cannot agree more with the author: Become a woman of the Word. Jen Wilkin does a wonderful job in explaining why is it important -extremely important- to study the Word of God faithfully. I would give this book 5 stars from pages 1-108. On the next pages (p.109-145), the author proposes a method to study the Scriptures (and because of these pages I dropped the rating down to 4 stars). Her method is good and in-depth, but I am more afraid about all the discouragement that it may bring to all the women out there (especially to those with little ones, or full-time jobs) trying to get into the Word. As my pastor says, "we need to always be able to discern the principle from the methods." 2014 is proving to be a good year for newly published Christian women's books, a genre whose weaknesses and shallowness I and many others have oft lamented. Women of the Word: How to Study the Bible with Both Our Hearts and Our Min 2014 is proving to be a good year for newly published Christian women's books, a genre whose weaknesses and shallowness I and many others have oft lamented. 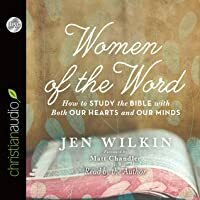 Women of the Word: How to Study the Bible with Both Our Hearts and Our Minds is a clarion call to today's Christian women to lay aside poor Bible study habits and to dig deeply into patient, purposeful intake of the full scope of Scripture, examining God's Word word-by-word, and within context of The Big Story. Just like our culture is currently learning that this the case with food, the more processed your Bible study is, the less healthy it is for you. Jen Wilkin encourages women to "put the ruffles in the back," (you'll have to read the book to learn the specific meaning of this one :)), to put away flaky bible study, and to realize that simply "doing devotions" or a "spending time in the Word" are often merely buzzwords that have not been further elaborated or adequately demonstrated. Yet she writes without intimidation; her own words are neither lofty nor inaccessible. Instead, Jen writes as a skilled teacher, articulating with precision and simplicity, giving her readers a helpful framework for studying God's word. This guide gives the reader specific steps to follow while simultaneously allowing freedom for individual seasons of life, speeds of learning, and the relinquishing of poor study habits. In going through each of these mistaken ways to approach God's Word, Jen not only discusses how easy it is to treat Scripture carelessly, but how important it is that we take a careful, studious approach. Although alliteration is occasionally symbolic of shallow Bible study, in this case it's a well-crafted pneumonic device. Under these five foci, Jen addresses the importance of understanding metanarrative (the big-picture story of the Bible) and understanding the Bible as literature (focusing on an understanding of specific authors, the time of writing, the intended audience, the style of writing, and the purpose of writing). Comprehension - "What Does It Say?" Interpretation - "What Does It Mean?" Application - "How Should It Change Me?" What does this passages teach me about God? How does this aspect of God's character change my view of self? While she does give specific instructions, Jen nonetheless is teaching her readers to fish, rather than simply handing them pre-selected fishes. Or in the words of Jen's opening analogy, she gives her readers a spoon to move their "mountains of Biblical ignorance." Women of the Word is easy to read (can be read in just a few hours), but is also valuable as a Bible study companion — using it as a reference and tool as you learn to navigate exegesis of individual passages. Christian women are hungry for God's Word. In the absence of being taught how to feed ourselves or where to find the healthy food, women are turning to the ineffective approaches listed above, to false teachers, or to anyone who will claim to feed them. Others have been told that "spiritual meat" isn't food for women, and some have become content with a diet of milk and watered-down Word. Yet we can't expect a quick-fix: studying God's Word takes discipline, persistence, and patience. And as we labor through the text, we soon realized we are being filled, we are growing, and our hunger is increasing. Regardless of where you are in your spiritual journey or how much Bible study training you have under your belt (or your fluffy tights :)), I can guarantee that anyone who has a desire to study God's word will walk away from this book better equipped to do so. Does Every Passage Have Personal Application? One minimal concern with Jen's instructions for Bible study is found in the final step of making application. Because her teaching is so specific and corrective elsewhere in the book, I think further clarification on this particular detail is warranted. Not every passage is going to contain specific personal application or even merit a specific, immediate response. Sometimes, the most specific application that can be wrestled out of certain texts will be to simply step back in awe of Who God is. Sometimes, and Jen does address this elsewhere (also listed in excerpts below), we are simply storing up a savings account of Biblical literacy for the Spirit to apply specifically at a later time. Jen is careful to repeatedly point out that Scripture is not a book about finding ourselves, but about learning who God is. She is even careful to note that while, yes, we will learn more about ourselves the more we study God's Word, it is only under the umbrella of coming to know who God is. When I understand who He is, I can begin to understand who I am in light of that. The truth is that God desires all people — male or female — know Him for who He is. A proper understanding of Scripture (and how to study Scripture) is absolutely essential for Christian women. Why? Because our Biblical theology affects our practical theology — how we live out what we believe before God and humankind. Our understanding of who God is directly affects our understanding of the world around us, of ourselves, and how we view and treat the countless other people created in God's image. And until we can dig deeper to understand who God is, we often leave ourselves with a very shallow interpretation of each of those areas. If we've been taught that it's okay to cherry pick the Scriptures, we end up twisting the Bible to say whatever we want it to say. If we haven't understood the metanarrative of the Bible, we are unable to discern what is truth when we hear Bible teachers teach opposite positions. It would behoove those in a position of teaching God's word to others or leading a Bible study to read this book. In fact, Jen devoted her last chapter to addressing the particulars of teaching Bible study. While this book is addressed particularly for women, this would also be a valuable resource in any man's toolkit for studying Scripture. Given the dearth of Bible study teaching for women, my hope is that many pastors and other men would seriously consider reading this book, both to sharpen their own understanding of being people of The Word and for increasing their knowledge of available resources. After reading this book, my hunger for further and deeper Bible study grew. This is a book I have long hoped would be written, and am thankful for this important resource in Women of the Word . "It seemed obvious that if God had given us his revealed will in the Bible, I should be spending more time trying to know and understand it. But the task seemed overwhelming. Where was I supposed to start? And why weren't the things I was already doing making the problem discernibly better? How was I supposed to move my mountain of biblical ignorance? On the other side of the mountain of my biblical ignorance was a vision of God high and lifted up, a vision stretching Genesis to Revelation that I desperately needed to see. I have by no means removed that whole mountain from my line of sight, but I intend to go to my grave with dirt beneath my nails and a spoon clutched in my fist. I am determined that no mountain of biblical ignorance will keep me from seeing him as clearly as my seventy or eighty years on this earth will allow." "Within our Christian subculture we have adopted a catch-all phrase for our regular habit of interacting with Scripture: 'spending time in the Word.' Church leaders urge us to do so. Authors and bloggers exhort us to value it. But what should take place during our 'time in the Word' can remain a vague notion, the specific habit it represents varying widely from person to person. The potential danger of this vagueness is that we may assume that our version of 'spending time in the Word' is moving us toward Bible literacy simply because we have been obedient to practice it. Not all contact with Scripture builds Bible literacy. Learning what the Bible says and subsequently working to interpret and apply it requires quite a different practice than many of those we commonly associate with 'spending time in the Word.' We cannot afford to assume that our good intentions are enough." "For years I viewed my interaction with the Bible as a debit account: I had a need, so I went to the Bible to withdraw an answer. But we do so much better to view our interaction with the Bible as a savings account: I stretch my understanding daily, deposit what I glean, and patiently wait for it to accumulate in value, knowing that one day I will need to draw on it. Bible study is an investment with a long-term payoff. Rather than reading a specific text to try to meet an immediate need, give the benefits of your study permission to be stored away for future use. What if the passage you are fighting to understand today suddenly makes sense to you when you most need it, ten years from now? It has been said that we overestimate what we can accomplish in one year and underestimate what we can accomplish in ten. Are you willing to invest ten years in waiting for understanding? Are you willing to wait a decade for an application point to emerge? Be encouraged that you are storing up treasure, eve if you don't see or feel it in the short term." "For me, these seasons [of not being able to devote long periods of time to Bible study] have sometimes lasted for years — sermons and podcasts were a lifeline. Having a structured group study to go to helped keep me in contact with the Bible, but some months even that was too much to take on. Some months, just keeping body and soul together for myself and my family seemed to occupy almost every waking moment. I don't consider those months to have been lost time or setback to my growth. They were times to employ patience, not with active learning of the Scriptures, but with waiting on the Lord. They deepened my desire for study. Some of my most fruitful times of teaching and writing occurred immediately after just such a period of waiting." Disclaimer: I received an electronic advanced reader's copy of this book in exchange for my review. But all opinions are my own. What a wonderful tool for learning how to best study the Word of God. This is one of the most helpful guides I've come across in my many years as a student of the Bible. Highly recommended. Overall, this book was just okay. It has fairly sound teaching, and I can appreciate Wilkin's desire to motivate more women to really know their Bibles. The book was really dry. I finally started skimming Overall, this book was just okay. It has fairly sound teaching, and I can appreciate Wilkin's desire to motivate more women to really know their Bibles. The bulk of examples/anecdotes were about herself and her family. I would have personally preferred reading stories from multiple women in various life stages. An accessible hermeneutic for ladies and seriously...just anybody. Women of the Word is an excellent resource for learning a process for Bible literacy. Would be helpful to walk through with someone in a discipleship relationship who would like to learn to study the Bible for themselves. This book was amazing. I loved the content and the way it was written. It had a lot of helpful tips about how to study the Bible and I can definitely see myself rereading it in the future. It was a very easy read, and yet it had a lot of depth. I highly recommend this book. 1. It ignited a much greater interest in Bible literacy. This is something I've found it easy to overlook or take for granted. I have read the Bible and attended church for more than 20 years, so I can assume that Bible literacy will simply come to me through Sunday morning preaching (which is vital - don't get me wrong!) and daily quiet times. But this book highlights the importance of studying the Bible with intention and depth. I want to know the Bible for myself, and be able to share it with others. I think this book could ignite a similar passion among other women. 2. It helped me realise that I can understand the Bible for myself. This may sound like a strangely obvious statement, but I found Wilkins's encouragement to only bring in commentary and other resources after an initial in-depth study for yourself, really eye opening for me. I have felt that because I have no formal Bible training, I must rely primarily on the teaching of others in order to understand a text, so it was refreshing to be encouraged that God reveals Himself in His Word when any of us are faithful to study it. That isn't to say my interpretations are infallible - I think Wilkin was very clear that we will still find passages hard to understand and will need to ask for as much help as possible as we seek to faithfully understand Scripture - but it was an enlivening to be reminded that God speaks to us through His Word directly. This book was so helpful! I can't wait to dig into my Bible study tomorrow morning using the things I learned from this book! I can’t tell you how incredible, insightful and especially convicting this book has been! I’ve always been one to love reading, no matter what it is, but need help when it comes to actually studying the Bible. This had so much insight, tips & examples on how to make the most of your study & where to start. This should be on the must-read list of every Christian women & men alike! I cannot talk enough about this book, so just read it. P.S. There’s also a FREE study/download that comes I can’t tell you how incredible, insightful and especially convicting this book has been! 2.5 stars out of 5 stars Better than just "okay" but I can't honestly give it a "good" rating because it's a little too "cutesy/fluffy" and I doubt I'll ever read/refer to it again whereas I refer fairly often to a few other books on how to study the Bible (esp. Kay Arthur's). She does have some good quotes but overall it doesn't live up to all the 5-star reviews I've seen. All those high reviews making this sound like the best book on how to study the Bible made me expect it to be much better. 2.5 stars out of 5 stars Better than just "okay" but I can't honestly give it a "good" rating because it's a little too "cutesy/fluffy" and I doubt I'll ever read/refer to it again whereas I refer fairly often to a few other books on how to study the Bible (esp. Kay Arthur's). She does have some good quotes but overall it doesn't live up to all the 5-star reviews I've seen. All those high reviews making this sound like the best book on how to study the Bible made me expect it to be much better. • "But until I see my selfishness through the lens of the utter unselfishness of God, I have not properly understood its sinfulness. The Bible is a book about God." • "If our reading of the Bible focuses our eyes on anyone other than God, we have gotten backwards the transformation process. Any study of the Bible that seeks to establish our identity without first proclaiming God’s identity will render partial and limited help." • "But I was missing the important truth that the heart cannot love what the mind does not know." of the story. But sound Bible study does more than that—it leaves the student with a better understanding of the Bible than she had when she started. Stated another way, sound Bible study increases Bible literacy." • "Contrary to our gut reaction, feeling lost or confused is not a bad sign for a student. It is actually a sign that our understanding is being challenged and that learning is about to take place." • "Repetitive reading offers two main benefits to the student: Scripture memory and overall familiarity with a text." o I disagree. Replacing Observation with Comprehension is like skipping the Observation step of Bible study and splitting Interpretation into Interpretation Part 1 and Interpretation Part 2. I do not believe it's a better term and if you've done any Precepts Bible studies you KNOW Observation is NOT just a casual perusal of the text. And per thesaurus.com, Comprehension is a synonym for Interpretation not a stronger word for observation - if she wanted to tweak inductive Bible study so much, why not use a better term? • No “hands-on” examples or instructions (and for me that brought the rating way down). Thankfully she did list Kay Arthur’s How to Study Your Bible in her reference section, which has very good directions for how to study the Bible. If you can only afford one book on how to study the Bible, Kay Arthur’s Precept’book is a better one to start with (or even her book "Lord, Teach Me to Study the Bible in 28 Days"), then read Wilkin’s book for a refresher/reminder on the reasons why inductive Bible study is important. • Many of her suggestions for hosting/leading a Bible study seemed to be straight out of the way Bible Study Fellowship structures their Bible studies and made me wonder if she got her start leading Bible study groups in BSF, and if so why not acknowledge them. I have a feeling I’m not the only who feels inadequate when it comes to Bible study. It's the reason I enrolled in seminary last year. Thankfully, there are many tools available that can help us learn how to do that, even if you don't want to pursue formal education. One such tool is Jen Wilkin’s book, Women of the Word, which explores the importance of Bible literacy and outlines the major components necessary for profitable study. I’m usually skeptical about books targeted to women, since they I have a feeling I’m not the only who feels inadequate when it comes to Bible study. It's the reason I enrolled in seminary last year. Thankfully, there are many tools available that can help us learn how to do that, even if you don't want to pursue formal education. One such tool is Jen Wilkin’s book, Women of the Word, which explores the importance of Bible literacy and outlines the major components necessary for profitable study. I’m usually skeptical about books targeted to women, since they often focus too heavily on emotional approaches and, quite frankly, lack depth. But I was pleasantly surprised at the substance and insight it offered, and appreciated the overarching focus on engaging the mind before the heart when approaching Scripture. Women in the Word combines sound biblical reasoning with practical steps, helpful personal anecdotes, and even humor (ever heard of the Xanax approach to reading Scripture?) to explain the importance of biblical literacy and help anyone learn to study the Bible better - even someone like me, who’s been in the Word for over thirty years. The book begins with a simple question that we all would be wise to consider: when you approach Scripture are you looking for truth about yourself, or truth about God? Too often we approach it like Moses did the burning bush, wanting to know what it can do for us but neglecting to see what it teaches about God. For instance, I’m studying through Proverbs right now and it’s easy to see what it says about how I should live — but the more important truth to understand is what it says about God, and then considering how I should live in light of that truth. The next major section considers the issue of Bible literacy, and our usual approaches to reading God’s Word — for instance: flipping the Bible open to a random passage each day (not reading it systematically), doing only topical studies (not reading it contextually), or relying too heavily on other people’s words about the Bible (not reading it directly). It’s easy to think we’re getting sufficiently fed by reading selectively, but as Wilkin points out, "Not all contact with Scripture builds Bible literacy!" Lest it all seem too theoretical or abstract, Wilkin shares many examples of using these principles to study the book of James. I found those concrete applications very helpful. She also includes a short section for Bible teachers (or those who will be someday), which considers various aspects of preparation and delivery of a Bible study lesson or curriculum. As I prepare to serve as a missionary and pastor’s wife, I anticipate many opportunities to teach other women, and her suggestions will certainly be beneficial. Whether you’re new to personal Bible study, or you’ve been doing it for thirty years, I’d highly recommend this book! It’s a resource I will gladly recommend to every Christian woman (and some men might appreciate it too! ), and plan to refer back to it in the future as I develop a more diligent habit of studying God’s Word. Disclaimer: I received this book for free from Crossway in exchange for providing an honest review. All opinions expressed herein are completely my own. This was a great book I really appreciated and will be going back to repeatedly. While I didn't find any "secret key to Bible study" or "the way to master God's Word in just 20 seconds a day", it is a very useful, succinct overview of good Bible study. There were a lot of good reminders. I think it is well-written and a surprisingly easy and enjoyable read. This book is really good. It convicted me and has spurred me into wanting to study the Bible more and know God better. I did find it overwhelming at some points just a bit, but I re-read a lot of chapters and that helped. "There are really only two possibilities in this life: be conformed to the image of God or be conformed to the pattern of this world." Jen Wilkin writes good, short books. She encourages 5 P's of Bible study: purpose, perspective, patience, process, and prayer. She provides solid examples, warnings, and exhortations, especially for teachers at the end. Even though I didn't know what rhumba tights were, this was still a helpful book. So, not just for women, even if they are the intended audience. Thanks, Jen Wilkin! Good encouragement for women who want to actually study for themselves, not just sit in front of a screen listening to someone else's ideas about the Bible and filling in the prepared blanks. I especially appreciated her encouragement for women to become teachers of other women. This book is sorely needed and I'm sorry I didn't buy it when I had the chance a few years ago. I'm encouraged afresh to realize I'm not alone in my frustrations! I really enjoyed this book! It is a book that makes you think and one that you'll want to read slowly in order to properly comprehend the message. The author did an excellent job at teaching you how to study the Bible in a more in-depth manner using what she calls the Five P's of Sound Study - Purpose, Perspective, Patience, Process, & Prayer. I especially appreciated her emphasis on changing the mindset of Bible study that focuses on who we are and what we should do to focusing on Who God i I really enjoyed this book! It is a book that makes you think and one that you'll want to read slowly in order to properly comprehend the message. The author did an excellent job at teaching you how to study the Bible in a more in-depth manner using what she calls the Five P's of Sound Study - Purpose, Perspective, Patience, Process, & Prayer. I especially appreciated her emphasis on changing the mindset of Bible study that focuses on who we are and what we should do to focusing on Who God is. Consequently, learning more about Him changes who we are. I found her analogies of how most people approach the Bible amusing, yet sadly true. Her examples of how she outlines her study of a passage is very helpful. While the author recommends sources that are rather liberal, I think the overall concept of her book is excellent and would highly recommend it. Wow...this is definitely a life-changing book! It has completely transformed my ideas of how to read and study the Scriptures. I borrowed this book from the library but it’s one I’ll be immediately purchasing to keep. Highly, highly recommend! Excellent book! Very well written. 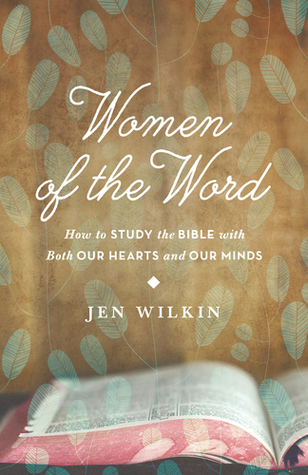 We need more women like Jen Wilkin encouraging women to study the Bible themselves. I highly recommend this book. Excellent guide to how to study your Bible. Worth reading. If you're looking for a book that will give you an awesome study method that's practical this is it! Jen really unpacks how to study the Word using the basics of the 5 Ws and 1 H by incorporating her 5 P's. I truly enjoyed this book. Her method is similar to that of Bible journaling, just a bit more organized. Though most of the tips were things I already knew and did, I enjoyed reading her point of view and seeing how her thoughts match with my own. Totally recommend this book for those who are If you're looking for a book that will give you an awesome study method that's practical this is it! Jen really unpacks how to study the Word using the basics of the 5 Ws and 1 H by incorporating her 5 P's. I truly enjoyed this book. Her method is similar to that of Bible journaling, just a bit more organized. Though most of the tips were things I already knew and did, I enjoyed reading her point of view and seeing how her thoughts match with my own. Very practical tips for greater personal bible study. And even better with a group. I have been looking for this book for years, I just didn't know it. I have been attending church since I was born. I learned a great deal of biblical information in my upbringing. I knew the answers. But as I moved into adulthood and started to take true ownership of my faith I struggled. I had always been a good student in school and in church but I had never truly learned how to study. When I asked for help in HOW to study I always got good answers, but they were more like little tips and trick I have been looking for this book for years, I just didn't know it. I have been attending church since I was born. I learned a great deal of biblical information in my upbringing. I knew the answers. But as I moved into adulthood and started to take true ownership of my faith I struggled. I had always been a good student in school and in church but I had never truly learned how to study. When I asked for help in HOW to study I always got good answers, but they were more like little tips and tricks which didn't feel helpful to me because I was still left struggling with where to even begin. Wilkin's book is a complete guide on exactly how to begin and how to continue to use study to learn about God and use what you learn about Him to conform yourself to His image. The section on how not to study the Bible made me wonder if she had somehow been stalking me, I related to it so much. She goes into detail and gives examples about what your study should look like without shoving her theology down your throat. In fact, I didn't feel like any of her theology came through at all (which is a problem I have had with similar books). She spoon feeds you HOW to get the answers from your own Bible study, she doesn't spoon feed you the answers. The content of this book is a lot more robust than the cover art suggests. But the book is targeting women and for good reason. Women are too often willing to rely on too shallow devotionals or fluffy women's "Bible studies" that don't actually do deep study of the Bible at all, and not taught or expected to go beyond that. Jen Wilkin's book is an excellent resource for how to develop a habit of deep Bible study for yourself. In this short but strong work, she outlines her "Five Ps" approach and The content of this book is a lot more robust than the cover art suggests. But the book is targeting women and for good reason. Women are too often willing to rely on too shallow devotionals or fluffy women's "Bible studies" that don't actually do deep study of the Bible at all, and not taught or expected to go beyond that. Jen Wilkin's book is an excellent resource for how to develop a habit of deep Bible study for yourself. In this short but strong work, she outlines her "Five Ps" approach and has a lot of helpful tips and reminders for what to do (and not do) when studying the text in order to keep the big story of the Bible centered and the details in their proper context. 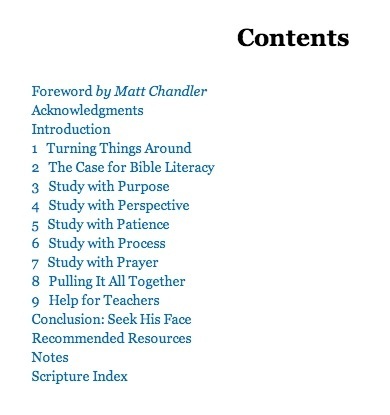 It's an invaluable resource on how and why to build biblical literacy—even if you don't use her exact method. Women of the Word is by Jen Wilkin. I read this book because we are using Wilkin’s study method for my high school Bible study. The leader recommended that we read it if we can get our hands on it, so I picked it up. Although the overall tone of the book did annoy me a little bit (sorry!) I found this to be a very good book with a lot of helpful information on how to study the Bible. I think this seems like a method that could even work for me in my personal studies, not just the high school stu Women of the Word is by Jen Wilkin. I think this seems like a method that could even work for me in my personal studies, not just the high school study I am doing as well. I did mostly skip the chapter mainly written to Bible teachers. Other than that, I read the entire thing. Jen Wilkin is a speaker, writer, and teacher of women’s Bible studies. During her thirteen years of teaching, she has organized and led studies for women in home, church, and parachurch contexts. Jen and her family are members of the Village Church in Flower Mound, Texas. She is the author of Women of the Word.